Malibu, California resident Kurt Kamm has written a series of firefighter mystery novels which have won several literary awards. He is also the author of The Lizard’s Tale, which provides a unique look inside the activities of the Mexican drug cartels and the men dedicated to stopping them. Kurt has used his contacts with several California fire departments, as well as with the ATF and DEA to write fact-based (“faction”) novels. 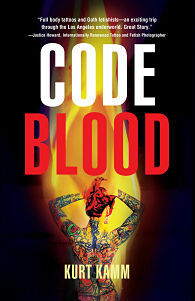 In his chilling and suspenseful multi-award winning novel, Code Blood, Kurt takes the reader into the connected lives of a fire paramedic, a Chinese research student with the rarest blood type in the world, and the blood-obsessed killer who stalks her. Colt Lewis, a young Los Angeles County fire paramedic responds to a fatal accident. The victim dies in his arms. Her foot has been severed but is nowhere to be found. Who is the woman, and what happened to her foot? During a weeklong search, Colt risks his career to find the victim’s identity and her missing foot. His search leads him to a dark and disturbing side of Los Angeles…an underworld of body part dealers and underground Goth clubs. He uncovers a tangled maze of drugs, needles, and rituals. Emergency medicine, high-tech medical research, and the unsettling world of blood fetishism and body parts make for an edgy L.A. Noir thriller. Kurt has built an avid fan base among first responders and other readers. A graduate of Brown University and Columbia Law School, Kurt was previously a financial executive and semi-professional bicycle racer. He was also Chairman of the UCLA/Jonsson Comprehensive Cancer Center Foundation for several years. Visit his author website at kurtkamm.com ? & on Facebook!